He hasn’t spent any time in laboratories. But Antonio Reyes has done a lot of experimenting. An integrated studies major at Florida Gulf Coast University, Reyes likes to try new things, to do “a little of a lot. I really spread myself in a ton of different aspects,” he says. Scheduled to receive his bachelor’s degree in December, Reyes started as a communication major. But his interests evolved, from communication to advertising, marketing and business classes, to photography, graphic design and digital media design. He also dabbles in online broadcasting. Off campus, he teaches hip-hop dancing. Reyes, whose family is from Colombia, graduated from Lehigh Senior High School then received an associate’s degree from Florida SouthWestern State College before enrolling at FGCU. For many people, college is where you decide what you want to do for the rest of your life, or at least for your first “real” job. The lab for much of Reyes’ vocational experimentation has been his part-time job in Academic and Event Technology Services (AETS) at FGCU. After he graduates, Reyes, 24, hopes to get a full-time job at AETS and pursue a master’s degree in information systems and analytics at FGCU. One option could be to start his post-FGCU career helping companies organize large gaming conventions like EagleCON, which he spearheaded last April at Alico Arena. Reyes led a group of FGCU students who conducted the third annual event. 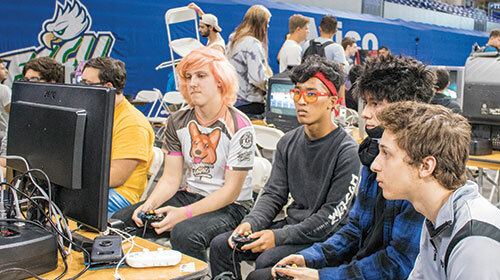 It offered a platform to competitive gamers, but also introduced what gamers call “geek culture” to the community surrounding FGCU. “My guiding philosophy with a big project is to be meticulous,” Reyes says. “I don’t like overlooking details.” Quadruple check everything, and share the workload. Reyes first learned about EagleCON – then called EagleLAN – in 2017 when he was working for AETS, which helped set up some of the technology. He wanted to be plugged in deeper. So he approached FGCU voice technician II Michael Forbes, advisor to the FGCU club, which organizes the event. “Little did I know that all of the members had kind of faded away,” Reyes says. Some graduated while others had burned out from organizing the 2017 event. Reyes joined what’s now called FGCU Gaming Hub in November 2017 and soon became president. He and Forbes, five club members and dozens of event volunteers conducted EagleCON. But the pair handled most of a details in only 60 days, evolving it from a gaming event to one with a full convention, with speakers, sponsors and vendors. In addition to Forbes, Reyes says he has received a lot of support at FGCU from three AETS colleagues: C.J. McFarland and Justin Mitchell, who advise him on graduate school options, as well as Wilson. They push him to try new things, Reyes says. 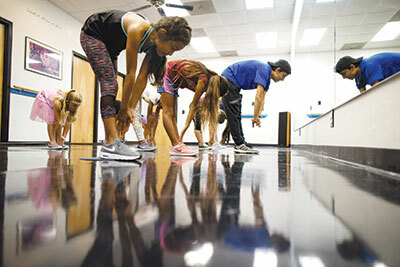 Reye’s off-campus hobby is teaching children ages 6-12 dancing at a small dance studio in Lehigh Acres. “It’s moving to beats, moving to rhythms … where the rhythm or beat originated from hip-hop culture,” he says. No break dancing, no back flips, but lots of effort to get the students comfortable in their own bodies, and with different choreographed steps. “My style usually originates around experimental (dance), where it’s just moving to rhythm,” he says. Reyes may never have a career as a hip-hop dancer, but he enjoys having the opportunity to experiment there, too.